In 2009, after losing 3 of our 20 cats to coyote attacks at our 20 acre Texas ranch home, a local hunter got together with an audio engineer to produce this 80 minute coyote deterrent audio CD. I’m happy to say that here in 2019 after over TEN years, there has still been no nearby coyote activity, and our cats continue to be safe outdoors. With our cats safely inside, we set up several outdoor cameras on our property and monitored coyote activity. As we developed our Coyote Deterrent we tried using recorded gunshots, dogs, dog packs, and a large array of other sounds to learn what, if anything, would keep these predatory animals at bay. We found that using recorded sounds of the coyote’s natural enemy – the mountain lion, or cougar, gave us 100% success. We discovered that within 24 hours of playing our Coyote Deterrent on a loop in medium sized CD radios deployed in two outdoor locations on either side of our large home, the coyotes stayed away. We don’t hear the coyotes yipping at night in the adjoining properties, we don’t find feeding remains or spoor. “I got my CD set up and running prior to leaving on vacation for a month. My daughter, who I had left in charge of my critters, did not see any coyote activity when she was here to feed in the early AM and in the evening. Since I have been home, I have done my early morning coyote watch and not seen any coyotes. So in my humble opinion, your “Run, Coyote, Run” Coyote Deterrent CD is working! Tomorrow night at our city council meeting I am going to relate to the council that this is at least one effective solution at a reasonable cost that the general public can use. 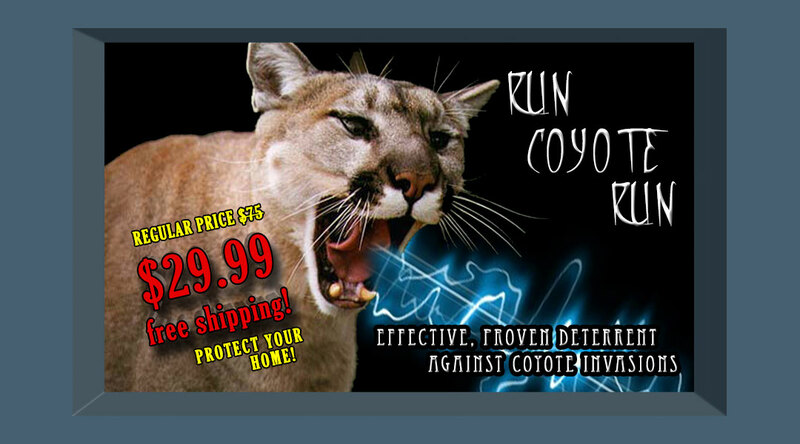 Although use of this Coyote Deterrent CD is no replacement for keeping your cats and small dogs indoors 100% of the time, we feel that our results are more than encouraging enough to endorse and justify this product. We are offering it for sale to aid others in the hope that its use will contribute to keeping their beloved animals as safe as it has ours. Electronic devices that perform similarly to Run Coyote Run cost over $150, take time to produce, are limited in their volume output, and are subject to mechanical failure. This CD can be purchased at a fraction of that cost and can be used in anything from small CD radios to large amplified sound systems, depending on your needs, making scalability very easy and accessible. “Over the course of 10 days in mid-September my poor chickens were terrorized 4 different times by a coyote salivating in front of their hen house door. I haven’t seen that many coyotes in the 10 years that I’ve been living in this house! The fact that I was seeing some of them as late as 11:00 in the morning was even more unnerving as they usually don’t hang around beyond the early dawn. Knowing that I was actually SEEING this many of them meant to me that there were probably even more instances where I wasn’t seeing them, and that concerned me. I took to the internet in search of an effective coyote deterrent offering a way to discourage coyotes from coming around. I found this site and ordered the CD. It plays various wildcat sounds at varying volumes and intervals. Since the mountain lion and cougar are the coyote’s natural enemy, these sounds are said to be a natural deterrent. I ordered one, installed it under a bush right next to the hen house, and put it on continuous play. Don’t worry, I warned the neighbors! It can definitely give you a jump start when you’re outside at night and one of the loud, random sounds comes on out of the blue! The first time the chickens heard it they just about beat each other up to see who could get in the hen house first! The next few times weren’t as dramatic (except for Ingrid, she’s a little skittish). Most of them just froze in place until they were sure it was safe to move. After a few days, it didn’t phase them at all.